Initiated by Ghana in 2011, large-scale upward revisions of GDP estimates have been announced by several African countries in recent years. These announcements preceded an exercise carried out in each country; the revision of methods and base data used to calculate the Gross Domestic Product(GDP), known as rebasing GDP. In 2014 alone, Kenya, Nigeria, Tanzania, Uganda, and Zambia all completed rebasing exercises, which led to significant revaluations of their GDPs: Nigeria’s GDP nearly doubled, Tanzania’s grew by 33%, Kenya’s and Zambia’s increased by 25%, and Uganda’s rose by 13%. Typically, GDP figures are published in two forms: nominal GDP (GDP at current prices) and real GDP (GDP at constant prices). Economists and policymakers generally defer to the real GDP for analytical and decision-making purposes because it values the output of goods and services using the price level of a designated year, known as a base year. Using a single price level for the entire GDP series in this way helps to ensure that observed changes in GDP result from actual changes in the volume and value of goods and services produced in the economy, rather than changes in inflation and exchange rates. Contrary to popular belief, it is not only the price level of the base year that influence the real GDP series, but the entire structure of the economy as observed on that base year. When designating a base year, an establishment survey is conducted to identify the volume of production in each industry. For future GDP estimations, statisticians gather data from a representative sample of firms in each industry, which they use to estimate the growth of production in that particular segment of the economy. The various industry specific growth rates are then multiplied by the industry weights measured in the base year. The result is the growth of the overall economy since the base year. However, with time, the economy undergoes significant structural changes such that the pattern of relative prices in the base period increasingly becomes irrelevant. On the production side, innovations lead to new products appearing in the market while old ones disappear due to obsolescence. Larger changes also occur due to the non-comparability of goods and services between distant periods. On the demand side, structural changes appear in the consumption patterns as well as in the utilization and acquisition of capital goods. Due to these structural changes and over time, some industries and sectors get misreported in the national accounts while others are simply ignored. In order to avoid these problems, it is recommended that the base year for estimating GDP be updated periodically. This involves replacing the old base year with a more recent year, adopting the price level for the new base year as the constant price level for the economy, and conducting a new survey to obtain more accurate industry weights used in GDP estimation. This process is known as rebasing GDP. Why should Cameroon Rebase her GDP? Cameroon continues to rely on the year 2000 as the base year for her GDP calculations, meaning that the composition and structure of the country’s economy in year 2000 is still the basis for which economic activity in the country is currently being assessed. Given the recent explosion in the scale and scope of telecommunications services, a burgeoning tech landscape, dwindling oil prices and a host of other observable changes in the economic environment, it is time we join the queue of African countries reassessing their economies and updating their systems of national accounts. This may reveal important structural changes in the economy, with wide reaching implications for policy makers and investors. To understand these possibilities, let us look at the results of rebasing exercises undertaken by other African countries. Nigeria’s rebasing lifted its GDP from $270 billion to $510 billion in 2013, revealing not only that its economy surpassed South Africa’s (becoming the largest in Africa), but that its share of sub-Saharan African GDP was 31.7%; up from 21.3%. This 90% increase was attributed to hitherto under-reported or ignored sectors such as telecommunications, movies and retail. Kenya’s revised 2013 GDPof $55.2 billion was 25% larger than previously estimated. This augmented its per capita income from $994 to $1,269, allowing the World Bank to re-categorize the country from a low-income to a lower-middle-income country. This growth came from slightly greater increases in the contributions of agriculture and industry than was previously estimated. It also led to the creation of many new subdivisions for fast-growing sectors such as Information and Communication Technology (ICT), which was formerly classified under transport, storage, and communications. In Tanzania, the revised GDP for the 2007 benchmark year saw small downward revaluations of agriculture from 27.1 to 26.8 percent, and industry from 21.1 to 20.2 percent. It also saw an upward revision for the services sector from 43.3 to 47.6 percent. There is substantial evidence to suggest that the Cameroonian economy in structure and size may not fit current macro-economic data. In 2015, the Minister of Small and Medium Sized Enterprises (SMEs), Social Economy and Craft asserted that small and medium size enterprises officially made up 95% of the economy, lamenting that they only contributed 36% to GDP. This is supposed to be a sign that Cameroonian enterprises are under-reporting their output in order to minimize tax liabilities. According to the Heritage Foundation’s 2017 Index of Economic Freedom, Cameroon had a tax burden of 12.2 as a percentage of GDP with a 33% corporate tax rate. This burden is far below the average for other developing countries. Generally, countries with a well-evaluated GDP base have better mechanisms for ensuring tax compliance, and can achieve a higher burden without the risk of over taxation. 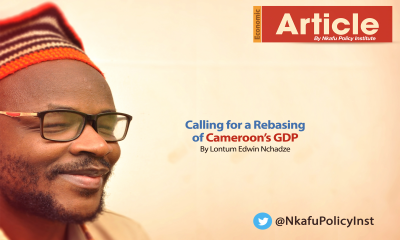 It is therefore imperative that the Cameroon government undertakes a GDP rebasing exercise to get a true picture of the size and structure of the Cameroonian economy. This has implications for a wide array of economic stakeholders. For instance, the performance of the government in revenue collection, capital spending, external debt and budgeting can be benchmarked against similar economies, while also providing investors with more accurate information on which to base investment decisions. Lontum Edwin Nchadze is a Contributor for the Economic Affairs Section at the Nkafu Policy Institute. He is a Statistical Analyst in the Department of Budget at the Ministry of Finance, Republic of Cameroon.